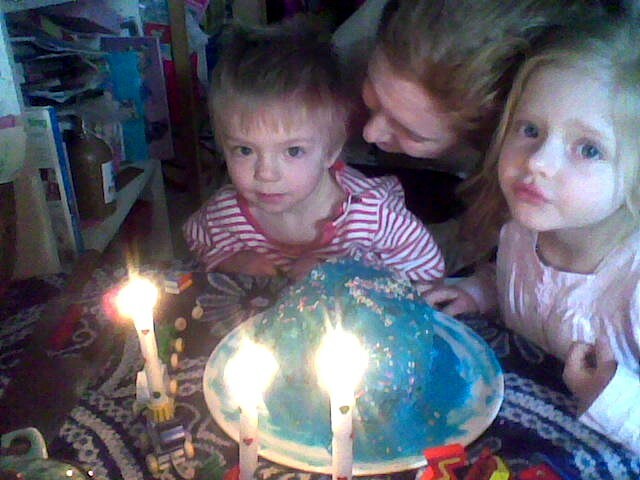 This is the official photo from Leo’s third birthday on Friday March 14 at Kindergarten. Maia looks very happy! Two days ago I went to Wikipedia in Chinese and stumbled on a photo of the Dalai Lama. The browser started generating error messages. When I tried to get there again, my screen went black. Then it was blue, with a message from Microsoft about a serious system failure. “Starting memory dumping” was at the bottom. I had been using Gladder, a Firefox extension for circumventing the Great Firewall when you’re in China. In the 1980s, when I was an undergraduate student, we had a Chinese reading class. It was mostly Chinese government-issued information on Tibet. There was one phrase I remember. The soldiers of the Chinese People’s Liberation Army were generous, so they didn’t ask the Tibetan people immediately to pay back the cost of pacifying their land. That was a memorable sentence. 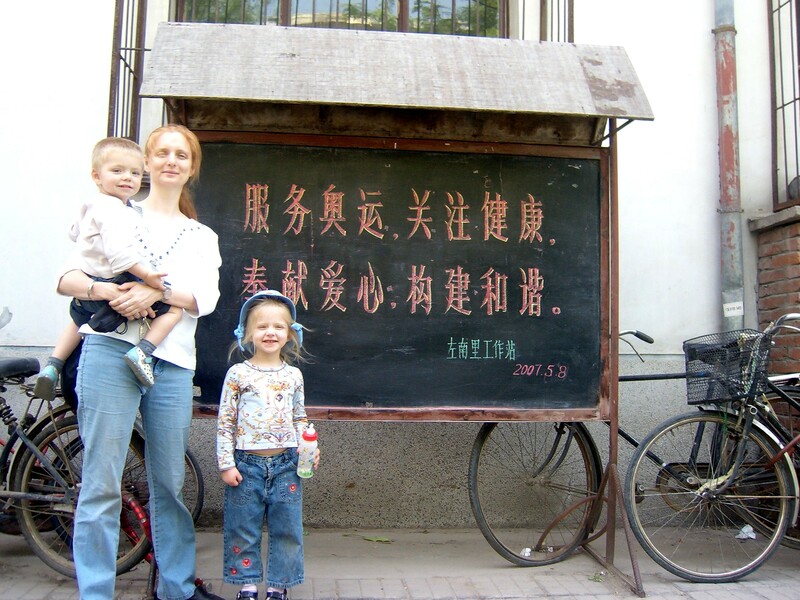 Then in 2001 or so I was translating and dubbing films for the Ministry of Culture in Beijing. There was a report on celebrating 50 years of liberating Tibet. Somebody important called me and asked me to please finish it quickly. It was a very important piece. Hu Jintao, who was already very important back then, had led a central party delegation on a fact-finding trip through Tibet to prepare for the celebrations. They stayed at ordinary people’s homes. And when they left in the morning, they gave the peasant family gifts to thank them for letting them stay. They gave them framed pictures of the core leaders of the Chinese Communist Party. Chairman Mao Zedong, Chairman Deng Xiaoping and Chairman Jiang Zemin. That was a memorable scene. What is art? What is music? Music makes you dance or cry. Art is truth. It’s the truth in the ear of the beholder. Or in other orifices. Or somewhere in between. They call it the heart. There have always been found objects. And pictures of leaders. How are you doing? 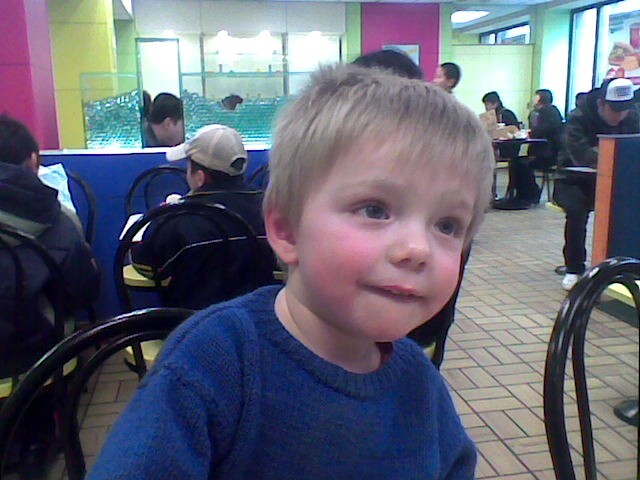 This is Leo at the local McDonald’s. They are bigger than the local KFC, and have a good playground inside. Actually, the weather has been warm enough to play outside for a long time now. 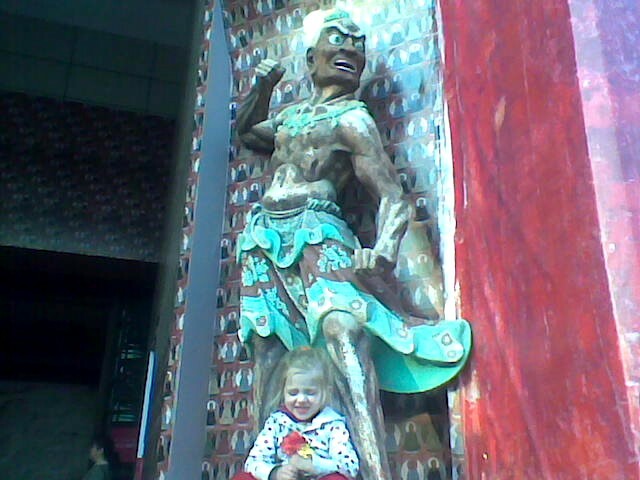 Yesterday we went to the Meishuguan, the National Gallery. They’re having a very popular Dunhuang exhibition. I co-translated a book on Dunhuang last year, and I have been there in 2000. This time we went with a painter (Zhuang Zhuang’s mother), who had worked in Dunhuang with her father. The great thing about this exhibition is that they have gathered reconstructions and copies of the murals from the last 60 or 70 years. Many copies and cave reconstructions are very good. The really tried to transform the whole museum into a replica of the site, as far as possible. The caves in Dunhuang are only unlocked when a tourist group comes through, and then the cave is locked again after five minutes. So you have to stay the whole day and follow many different groups, like I did. But here in Beijing it is all spread out for everybody. Buddhism for the masses. It’s great. 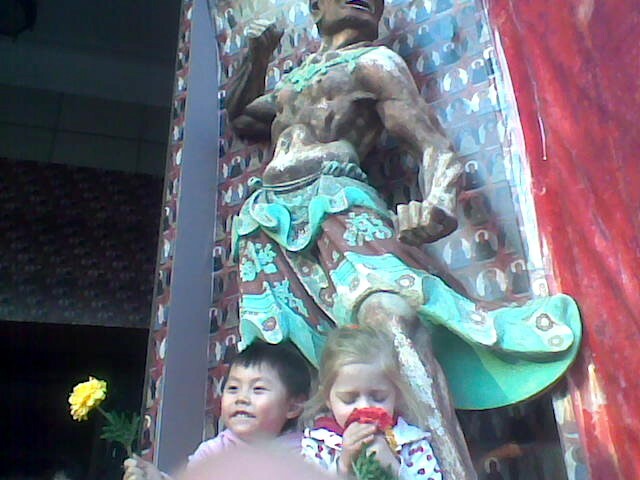 And here are Maia and Zhuang Zhuang at the Meishuguan entrance. This used to be a museum for Chinese stalinist oil paintings, mostly. They still have them somewhere. But in the last two years or so they have had some very interesting exhibitions. They had the Zhou brothers, who come from the 1970s, emigrated in the 1980s and made it big. They gave the whole building a big makeover. The canteen in the backyard is clean and good. There are a lot of military police stationed in the northwest backyard. I don’t know if they are only there to protect the art. Maybe it’s their local headquarter. The whole city is swarming with police guards, and even more with construction workers. They are having the yearly National People’s Congress and Chinese People’s Political Consultative Conference meetings in the Great Hall of the People on Red Square. The construction workers are transforming the old streets immediately south of the Square into a great faux antique theme park. Qianmen Dajie, the south part of the north-south axis going through the city since Mongol times 800 years ago, is completely evacuated and blocked off, including all the side alleys for half a mile in each direction. You can see the theme park buildings rising behind the construction fences, which are decorated walls. Decorated with old city photos from 100 years ago, in part. Everybody moved out, and make it all new, for the foreigners. Southwest of Qianmen, closer to Hepingmen and the west part of Dazhalan, there are some Hutongs left. They are being renovated. Some old buildings are torn down, but they are being rebuilt with plumbing. You can see the swarms of Mingong (migrant workers) busy in all the Hutongs in the city that are still intact. Maybe they are doing a good job. So it seems that some parts of old Beijing will remain. Some of them are tourist streets already. Nan Luoguo Xiang is a creative quarter, to some extent. They have torn down some streets there too, east of Shichahai lake. Maybe there will be a canal side park. The remaining Hutongs southwest of Qianmen retain some features of the former Qianmen area, complete with cheap hotels. Maybe the mosque is still there, too. People are friendly, the real ones that remain. Friends of us got robbed in some Hutong cul-de-sac near the Square and the Forbidden City last year. Bicycle cab took them for a ride. Not surprising when huge areas in the city center are instant ruins and construction sites. The whole Qianmen walled-off theme park construction site reminded me of Dali, Yunnan province. In 2006, they had been building a six-lane freeway next to the west side of the old city for a few years already. There is a big new highway on the east side already, all the way around the lake. But this is the old Burma road, so they want to show off all the way to the border. And about half of the old city was still off-limits. Some are plants and factories, but some parts are just old streets being torn down and replaced with malls for foreigners. And Chinese tourists, of course. Why did we go all the way to the south of the city at all? The daughter of an office colleague of Jackie was baptized in the Catholic church at Xuanwumen. This is Maia in the chapel for the baptism ceremonies. No, she’s not baptized yet. They do it later in the Lutheran churches. Jackie is Protestant, and we have frequented Lutheran services since our wedding. Christianity in China is a very interesting topic. The old church buildings, both in the cities and in remote places all the way into the Himalayas, are all worth visiting, even if you are not religious at all. More than half of Tian Zhuangzhuang’s film on the old tea road in Yunnan is about churches, temples and believers in remote mountain valleys. And here we are at the McDonald’s again. I don’t have a photo from Qianmen Dajie construction street, because I was carrying Leo asleep around the theme park wall when we passed the south gate of that construction site which is at least as big as the Forbidden City. Would have been a great picture, with a real camera. But there was a guard, who was just closing the gate. 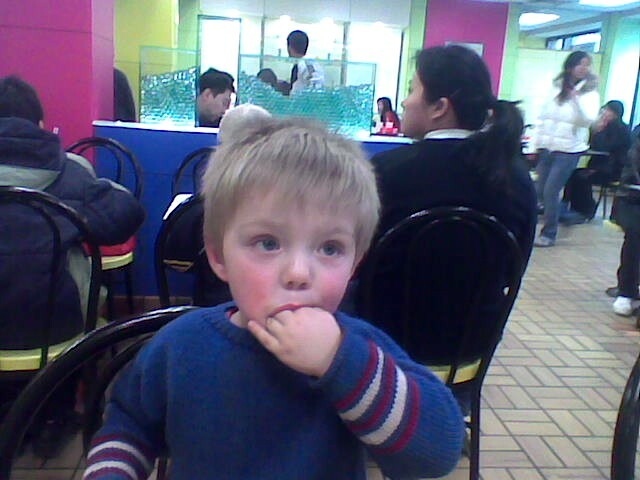 Leo will be three on Friday. 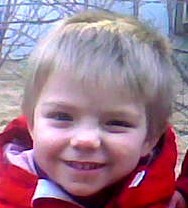 He has grown, but he still doesn’t say more than five clearly discernible words in any language, although he understands a lot and tells you very forcefully when he needs something. He needs to run around a lot. Not fussy with food at all though, and very mild in his temper in general, compared with Maia, or his parents. But Maia can play rather quietly with a friend for hours now. She did that last Friday night in our yard downstairs, with Yang Yang, the daughter of a Chinese neighbour on staircase #2 in our building. Yang Yang goes to the same Kindergarten group as Zhuang Zhuang, Maia and Leo. Yang Yang’s father went with her to the Water Cube and the Bird’s Nest, the two big new Olympic sites. They had asked for photos with the kids in front of the new sites at Kindergarten. 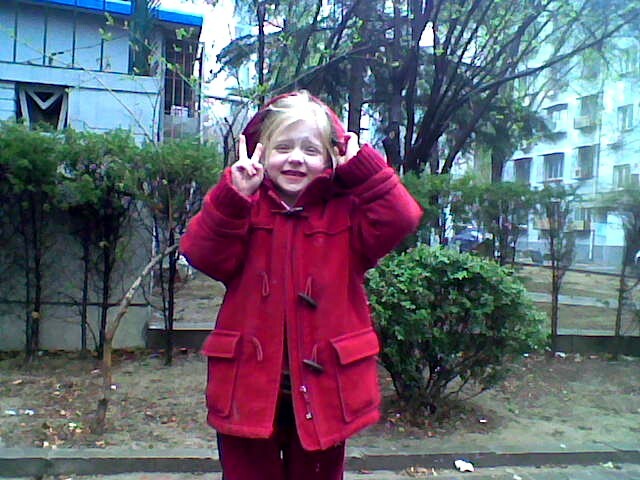 Last week, at the last parent’s meeting, they appealed again for photos. Yang Yang’s father advised us against going. Most of the area is still a construction site, he said. Oh well. 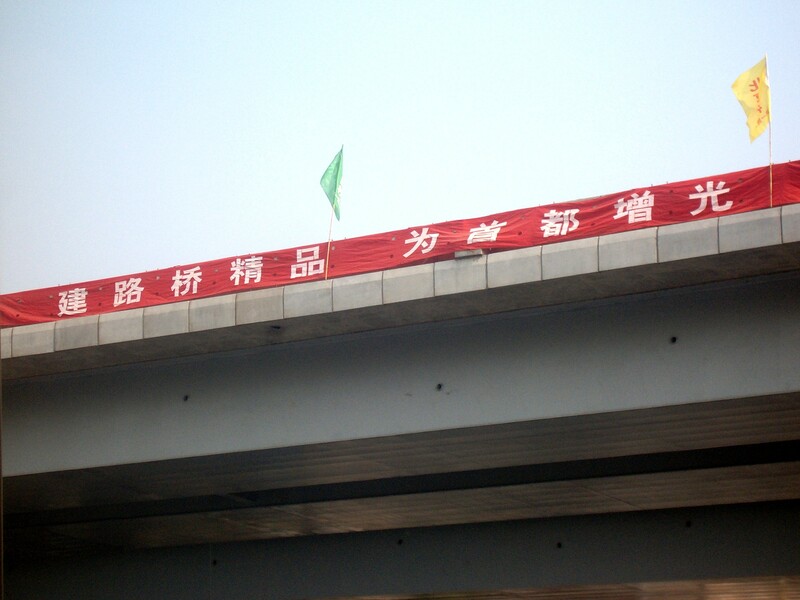 I have photos of slogans for the Olympics, in the Hutongs and on banners at highway construction sites. They probably don’t want those. They had asked for a small gift for Women’s Day also, for the kids to pass them around the women in the neighbourhood. I didn’t come up with anything, and Jackie was too busy. On the bus on the way back from Qianmen East street on Saturday there was a long speech for Women’s Day on TV. The guy holding the speech was very important at the National People’s Congress and The Chinese People’s Political Consultative Conference. I couldn’t see the screen. The conductor made people get up to give us two seats when we got on. Leo was still sleeping. Maia sat down on the space above a wheel. Then Jackie stood up for an old man and sat there on the wheel with Maia. It was a long trip. Beijing bus lines go on forever. And then there is the traffic. The 120 makes a detour around Guomao, probably in an effort to ease the congestion on Jianguomenwai. 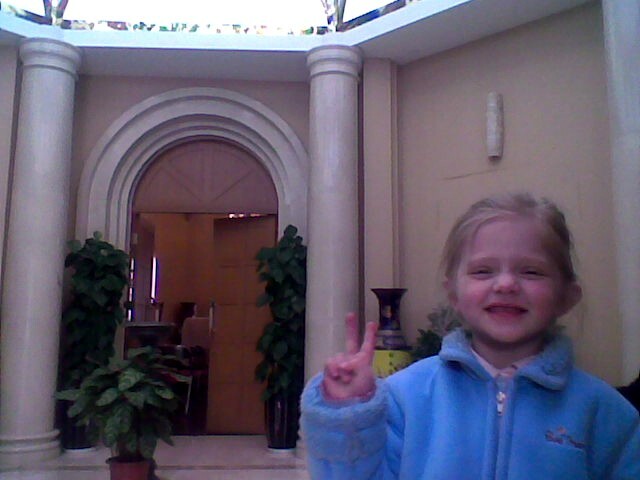 Kids in developing countries often make a victory sign in photos. Maybe they learn it in Kindergarten. 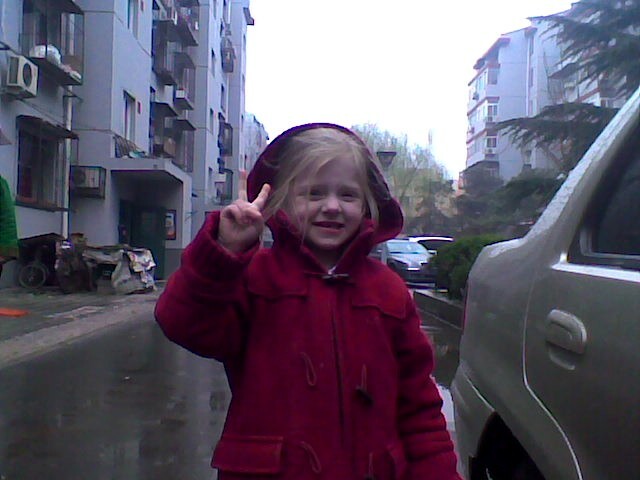 This was in Beili, on the way to the Kindergarten, just across the road from our place. By the way, if you are in Beijing, please come to Leo’s birthday party on Saturday. The houses in Beili are the same as in Nanli. We live at the top of staircase #5 in house 6. The compound is not too bad. Children can run around, and there are some trees. But even here in our compound we have some Olympic activism. The residents’ committee got rid of all private additions to the greenery on ground level. Our terrace is to high, thankfully. The mulberry tree is still standing, but they removed the trellises that held up the lower branches, and so they had to cut off the lower branches this weekend. Have a good spring! Serve in our Olympic venture, pay attention to your health. Give and share affectionately, let us build up harmony. the new york times is mostly right. the new york times is mostly left. and mostly better left alone. nanfang zhoumo is mostly right. and both are often not enough. and they arrest a dissident. und hoert auch frueher wieder auf. und fahren tagelang nach haus. das eis ist endlich richtig fest. und warten stundenlang auf fisch. sie steigen schon das ganze jahr. das feiert man nicht ueberall. erleuchtet war. und deshalb wird es wieder hell. es ist die woche vor neujahr. vom alten jahr zum fruehlingsfest. des grossen kaisers zhu yuanzhang. und gross und klein war proskribiert. so fanden sie das “fu” nicht mehr. und seitdem klebt das glueck verkehrt. das war an diesem tag nicht schlecht. You are currently browsing the 中国大好き blog archives for 2008年3月.